The oil business came about from an idea several years ago when fuel prices soared and the American economy faltered. There was a lot of talk about alternative fuel sources. That sparked an interest in an area that I knew very little about. I began researching, visiting oil plants, and talking to individuals in this field. My initial thought was to make my own fuel. The equipment needed to extract oil is expensive, and the savings on fuel would not pay for the equipment for many years. I was fortunate enough to meet a couple of people who influenced me to consider growing, processing, and selling food grade oil During this time I discovered the cold pressed method of oil extraction which does not use chemicals or high temperatures to remove the oil, This process leaves valuable vitamins and nutrients in the oil. The oil also retains its natural flavor and color. In 2012 I grew my first crop of sunflowers for oil production and by the end of 2012 I had pressed oil from sunflowers, pecans, and peanuts all grown in Wilcox County. More oils followed and Oliver Farm Artisan Oils quickly caught the attention of chefs and foodies. As oil production has expanded and I begin to understand a little more about the properties and uses of various oils I am filled with awe and wonder at the countless ways it can be used. Naturally tasty, nut and seed oils are necessary for balanced nutrition. They can be used in fuel, cleaners, soap, cosmetic products, and have medicinal uses as well. Our simple process, genuine care for your approval, and desire to keep it pure and fresh make Oliver Farm a natural choice for any pantry. It is easy to fall in love with this instant classic. Oliver Farm Pecan Oil tastes just like the delicious and nutritious nut. “Wow!” is the response we get when people taste it for the first time. It has a more amber color than many of our oils and it is packed with Vitamins and minerals. The fat profile makes it acceptable as a heart healthy oil. We use this oil frequently at home as a butter substitute in making eggs and its warm nuttiness make for excellent vinaigrette pairings. A high smoke point of 470 degrees make it suitable to sear and use on the grill. Or use it like us and drizzle it over just about anything to add a little Southern swag to your favorite meals. Our first oil to gain national attention by winning a Good Food Award in 2015, it has also been featured in Garden and Gun as their Made in the South Food Category Winner. In January 2018, Oliver Farm Pecan Oil won its second Good Food Award. Pressing peanuts was a no brainer. Pitts, GA is located in an area that is known for peanuts. We have peanut statues, peanut festivals, and the one and only President from Georgia was a peanut farmer who grew up near here. Our schools still teach the importance of George Washington Carver’s work and with that in mind, Oliver Farm Green Peanut Oil can transport you to a different place in time. 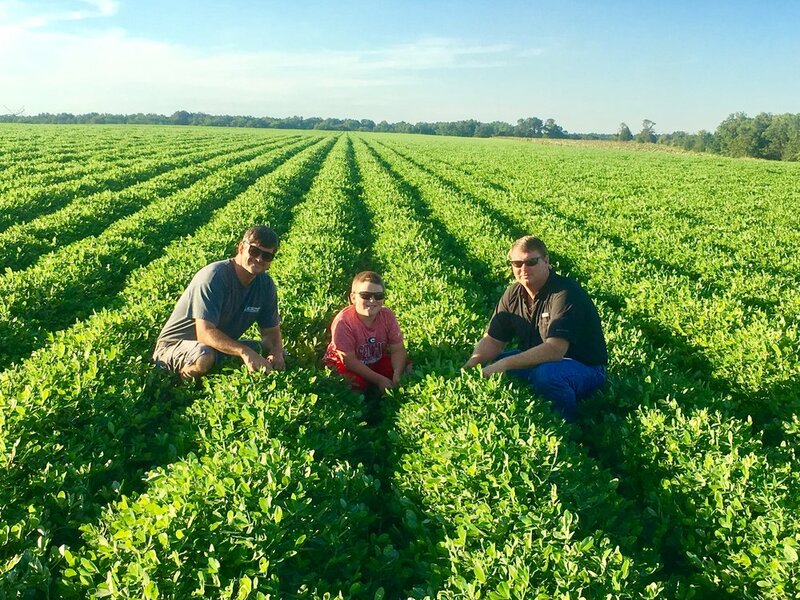 Chef Sean Brock said, “The first time I tasted green peanut oil, it was as if I was standing in a field pulling peanuts out of the ground and eating them.” There is no secret to what we do, we take high quality peanuts, remove the oil, filter it, and bottle it. Many of the high end restaurants use our Green Peanut Oil as a finish like Miller Union co owner and Chef Steven Satterfield who helped name our unique oil “Green” for its popping taste. Oliver Farm Green Peanut Oil was the Garden and Gun Made in the South Food Category Winner in 2015 and won a Good Food Award in 2016, and its growing popularity caught the eye of The New York Times in 2016. The fat profile of our Green Peanut Oil is nothing to scoff at either, its slightly higher in Saturated fat and slightly lower in Monounsaturated fat than other oils. It also has a smoke point of 400 degrees. This is the oil that got it all started in 2012. Clay grew sunflowers with the intention of harvesting and pressing them for oil that fall. Blessed with a good crop that year he purchased a press and made oil from sunflowers grown here on the farm. Once we tasted it we knew we had something special. There was no doubt it tasted like sunflower seeds. Oliver Farm Sunflower Oil has a bold rich flavor and is a bright yellow color. It is a great oil to use for light sautéing and its bold flavor is great on salads. It is the families favorite to use for frying fish. Garden and Gun chose our Sunflower Oil as its Made In the South Food Category Winner in 2015 and it won a Good Food Award in 2017. A surprising fact to many people is how healthy our cold pressed, unrefined sunflower oil is. We purposely grow high oleic sunflowers for its healthy fats. Oliver Farm Benne Seed Oil is extracted from the seeds of landrace West African benne (Sesamum Indicum). Brought to America by African slaves, this hearty plant with many uses made its way into the local cuisine. Gradually replaced by commercially produced oils and bred to resist shatter, the flavor of this unique oil was nearly lost. Our partnership with Anson Mills, who grow the certified organic seeds along with countless others that are rare, endangered, or worthy because of flavor, has allowed us to offer the first commercially available Benne oil in the modern era. While it sits on Slow Foods Ark of Taste for rare and endangered foods we hope to save this beautiful, flavorful, deeply cultural oil by consuming more of it. Winning a 2017 Good Food award brought widespread attention to this rare oil. It’s complex and nuanced flavor make it a perfect finishing oil, and it was a favorite salad oil of Thomas Jefferson. Oliver Farm Infused Sunflower Oil is our best selling oil. People often want to know how we came up with the recipe. It happened one night as my wife Valerie and my mother Jurice were enjoying some bread and oil and began adding spices to the oil. Keeping some and omitting others they settled on the recipe and it has been popular from the start. We start with our high oleic sunflower oil then add eight herbs and spices that look so good in the bottle people can’t resist shaking it up. Once that happens, the flavors of the rosemary, oregano, basil, parsley, red pepper, black pepper, garlic, and salt blend perfectly with the rich bold sunflower oil. This oil was born for dipping bread, and there are a ton of other uses for it. Several local schools use it on their salad bar. It is a great oil to sautee vegetables or easily enhance grilled or baked meats. Oliver Farm Infused Green Peanut Oil is a sweet and spicy oil combining cinnamon, brown sugar, red pepper, chili powder, and Green Peanut Oil. This oil is fun to use and it adds a depth of flavor that is sweet, unmistakably peanuty and has a little heat as well. It is a versatile oil that can be used to spice up dessert recipes. It is also a great choice for dipping sweet breads. It really goes well with chicken and can be used as a marinade before cooking, a mopping sauce, or our children’s favorite, use it to toss grilled chicken wings or vegetables in. A favorite use at our house is to fry okra in the oil and garnish with salt and lemon. Watch your fingers. Oliver Farm Pumpkin Seed Oil is delicious and nutritious. It is packed with vitamins and nutrients and has a long history of health benefits including improvements in prostate health, skin irritations, and hair loss. Very high concentrations of zinc make this oil a powerful medicine. The flavor of this oil is equally amazing. While not suitable for high temperature cooking it has many varied uses. Of course, salad dressings are the most common use for pumpkin seed oil. Choosing a vinegar is a matter of taste, though apple cider vinegar is traditionally used, we prefer a sweeter, white or strawberry balsamic. Refine with salt, pepper, seasonings or herbs, it’s a delicious dressing for every salad. Pumpkin seed oil is great with seasonal fruits and delicious served over vanilla ice cream as well. The most recent addition to the Oliver Farm Artisan Oil lineup is Okra Seed Oil. The oil is a dark gold color with a slight green tinge. It has a unique flavor that gives a hint of spice without being spicy. Use it as a finish to add depth of flavor to fresh sliced vegetables, we like it on fresh, sliced tomatoes with salt and pepper. This oil has become a hot item among chefs across America. All Oliver Farm Gluten Free Flours are milled on site using the remains of the nuts or seeds that is expelled after the oil is removed. Each retains its distinct flavor and aroma and can be used similarly. These flours are high protein, low carb, and naturally Gluten Free making them a great choice for health conscious eaters and those with dietary restrictions. Oliver Farm Gluten Free flours are interchangeable with many recipes calling for other flours. They also are great for breadings and batters. Click here for a Flour Nutritional Comparison Chart with defatted pecan flour. Use pecan flour to make the best brownies. Green Cornbread you say? Get the recipe here. We are honored that these fine dining establishments use Oliver Farm Artisan Oils.